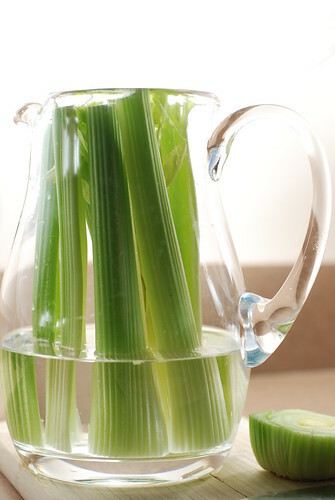 Since last night’s post dealt with a single stalk of celery, as many recipes do, I thought I’d share my celery preservation technique, because even though you might not use that celery in the next two weeks, you’ll try to hold onto it just in case. The best container I’ve found for keeping celery like this (and you know, it will last a solid two weeks this way too) is in either a pitcher or a vase. This is usually done to revive rubbery celery, but since I’m not likely to get to mine in the next few days anyway, I tend to go directly to the pitcher technique. Make sure you have your celery toward the front of the fridge too. Some older model fridges (and some newer ones too) get extra-cold toward the back and will freeze your celery, and there ain’t no revivin that stuff back from that!
. . . that’s all I got.